Intense turmoil in Syria and Iraq has created socio-political vacuums in which jihadi groups have been able to thrive. The Islamic State in Iraq and al-Sham (ISIS) had proven to be the strongest and most dynamic of these groups, seizing large swathes of territory in Syria and Iraq. Shortly after routing Iraqi forces and conquering Mosul in June 2014, ISIS boldly announced the establishment of a caliphate and renamed itself the Islamic State (IS). How did IS become such a powerful force? What are its goals and characteristics? What are the best options for containing and defeating the group? In a new Brookings Doha Center Analysis Paper, Charles Lister traces IS’s roots from Jordan to Afghanistan, and finally to Iraq and Syria. He describes its evolution from a small terrorist group into a bureaucratic organization that currently controls thousands of square miles and is attempting to govern millions of people. Lister assesses the group’s capabilities, explains its various tactics, and identifies its likely trajectory. According to Lister, the key to undermining IS’s long-term sustainability is to address the socio-political failures of Syria and Iraq. Accordingly, he warns that effectively countering IS will be a long process that must be led by local actors. Specifically, Lister argues that local actors, regional states, and the international community should work to counter IS’s financial strength, neutralize its military mobility, target its leadership, and restrict its use of social media for recruitment and information operations. 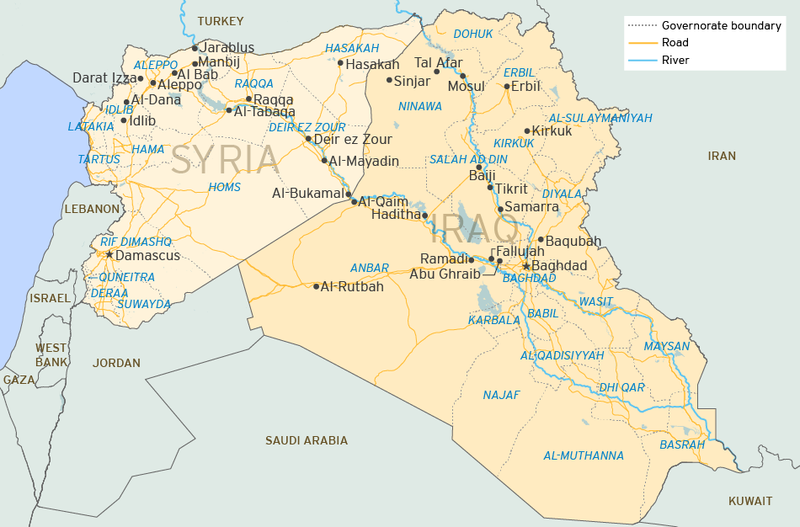 See below a map of Syria and Iraq, showing both countries’ governorates and principal cities, as well as rivers and main road networks. IS’s area of operations currently stretch from Al-Bab in northwest Syria to Baqubah and Baghdad in central Iraq. An ability to consistently acquire substantial revenue in order to efficiently fund effective governance and the provision of administrative and social services to civilians in areas under the organization’s control. Target the road transport infrastructure used to truck the oil to customers, which would have the added benefit of cutting off key nodes of IS communications and command and control. Expand and intensify existing international sanctions. Rapid mobility and the capacity to consistently re-deploy manpower and resources to newly active fronts. Focus on targeting IS’s ground mobility capabilities, particularly fleets of pick-up trucks and captured armored vehicles. This strategy would be carried out by local actors, backed by extensive air surveillance, airpower, and the provision of training and military equipment. A tightly controlled and capable senior leadership and military command and control structure on local and regional levels, responsible for managing professional military campaigns and maintaining momentum. Initiate a concerted intelligence-led operation at a local level by local actors with the objective of collecting information on the identity and areas of operation of IS’s senior leadership and military command. Feed into existing military operations against IS, a sustained erosion of IS’s experienced leadership would make the group more vulnerable to military ground maneuvers by rival groups in Syria and Iraq. The effective use of social media to spread and legitimize IS’s ideology, activities, and objectives, and to recruit and acquire international support. Continue the aggressive countering of IS’s online presence and challenge the organization’s religio-political doctrine through “mole” accounts within the jihad community online. A permissive environment symbolized by a continuing state of conflict and intense social instability in Syria and Iraq. In Syria, remove the binary image of opposition versus government and replace it with a more inclusive and broad focus on maintaining Syrian territorial integrity and social unity. Crucially, the international community must recognize and make clear the President Assad does not represent a unifying leader. In Iraq, build upon political progress already underway in Baghdad and initiate an integration of Sunni actors, including those involved in armed activities, into the national fold. Reinforce the capacity of the central government and its various structures to maintain a unified state whose constitution recognizes the equal rights of all communities.